How do I purchase DVDs of the series? By joining The Superbook DVD Club. When you join The Superbook DVD Club, you will automatically receive each new episode of Superbook. In addition, we will send you two free copies of each new episode in attractive packaging that you can give as gifts to others. Your tax- deductible gift will also help produce future Superbook episodes and bring the Word of God to children around the world. You can learn more about The Superbook DVD Club here. How can I log in if I forgot my username? You can also use your email address in place of your username to log in. Or you can contact a Superbook Team Member . Why doesn't the episode show that there were six separate days of creation? God's wonderful creative acts were shown briefly in an overview. Time limitations prevented us from showing the days of creation in more detail. Why is Satan shown as Lucifer during the rebellion in heaven? Many Bible scholars believe that Satan used to be a mighty angel called Lucifer. But when He rebelled against God, he became corrupted and evil. The Bible tells us, How you are fallen from heaven, O Lucifer, son of the morning! How you are cut down to the ground, you who weakened the nations! (Isaiah 14:12 NKJV). Who were the bad angels? The evil angels were the ones that Satan convinced to join his rebellion and be part of his demonic army. This is symbolically referred to in the book of Revelation, with Satan referred to as a dragon and the angels referred to as stars of heaven: And another sign appeared in heaven: behold, a great, fiery red dragon having seven heads and ten horns, and seven diadems on his heads. His tail drew a third of the stars of heaven and threw them to the earth (Revelation 12:3-4 NKJV). What happens to the angels when they are struck in battle and disappear? We used creative liberty to depict the battle between good angels and fallen angels. When an angel is struck down, it can no longer fight in the battle. Why did Lucifer change in form to be so ugly? Doesn't he come "as an angel of light" to deceive us? Lucifer's change in appearance was an outward reflection of how he had corrupted himself and become evil. On the other hand, he can try to deceive people by disguising himself as a good angel. The Bible tell us about Satan's deception when it says, But I am not surprised! Even Satan disguises himself as an angel of light (2 Corinthians 11:14 NLT). Was it Jesus or God the Father who walked in the Garden of Eden? Jesus was the one walking majestically through the garden. We depicted Him as radiant and divine, and we showed Him exercising miraculous power. The Bible reveals that the Creator really did walk in the midst of His creation: And they heard the sound of the LORD God walking in the garden in the cool of the day, and Adam and his wife hid themselves from the presence of the LORD God among the trees of the garden (Genesis 3:8 NKJV). Before Adam and Eve ate the forbidden fruit, why didn't the lion attack the people or animals? Before Adam and Eve sinned, the Garden of Eden was an unspoiled paradise. God had given Adam and Eve dominion over the earth, and animals did not attack people. Many Bible scholars believe that before Adam and Eve sinned, all animals were vegetarians. In the battle that was shown, why was Michael's sword flaming? We used creative license to show Michael with a flaming sword that is reminiscent of the flaming sword that kept Adam and Eve out of the Garden of Eden. The Bible records, After sending them out, the LORD God stationed mighty cherubim to the east of the Garden of Eden. And he placed a flaming sword that flashed back and forth to guard the way to the tree of life (Genesis 3:24 NLT). Why would Abraham sacrifice a lamb or ram? God Himself instituted the practice of animal sacrifice for the sins of people. After Adam and Eve sinned, God made clothing for them from animal skins. Much later, when God gave the Old Covenant Law to the people of Israel, He gave instructions for the sacrifice of certain animals as offerings for sin. The Bible tells us, In fact, according to the law of Moses, nearly everything was purified with blood. For without the shedding of blood, there is no forgiveness (Hebrews 9:22 NLT). The animal that was sacrificed had to be without any defect. This points to the sinlessness of Jesus Christ who died for the sins of mankind. The innocence of the lamb sacrificed by Abraham foreshadows the innocence of Jesus. Now that Jesus has died for the sins of the world, animal sacrifices are no longer needed. What were the images in the smoke of the burnt offering? They were highlights of Abraham's future, including joyful moments with his wife Sara and his son Isaac, as well as a very troubling time when God would tell Abraham to offer Isaac as a sacrifice. What was the counting instrument that Isaac had? It was an abacus–a device for performing mathematical calculations by sliding balls or beads along rods or in grooves. When Abraham recounts the time he had three visitors, why did you show Jesus as being one of them? The account of this extraordinary visit clearly reveals that the Lord was visiting Abraham. The Bible explicitly says that the Lord visited and spoke to Abraham. The Hebrew word translated as "Lord" is "Yahweh," God's holy name. Theologians believe that when God appeared in bodily form in Old Testament times that it was an appearance of Jesus. What did God mean when He told Abraham, And through your descendants all the nations of the earth will be blessed–all because you have obeyed me? God was foretelling the birth of His Son, Jesus Christ. In the human sense, Jesus would be a descendant of Abraham and Isaac. Through Jesus, people around the world can experience God's wonderful blessings of love, grace, mercy, and forgiveness. Can you tell me more about the birthright? Was the birthright just a tradition or was it commanded by God? The birthright was a common practice in which the eldest son would receive a double share of the inheritance from his father. The oldest son also became the priest of the family, and he inherited the judicial authority of his father. In the Law given by God to the nation of Israel, the birthright of an oldest son is protected so that a father could not give it to a younger, but favored, son. God told Rebekah that her older son's descendants would serve the younger son's descendants. Why did God say this? While the two sons were still in the womb, God knew the characteristics of each of them as well as that of the nations that would come from them. [Recall that God told the prophet Jeremiah, I knew you before I formed you in your mother's womb. Before you were born I set you apart and appointed you as my prophet to the nations (Jeremiah 1:5 NLT)]. Although both Jacob and Esau had character flaws, Esau seemed to have little regard for spiritual matters and foolishly sold his priceless birthright for a mere bowl of stew. His birthright would have secured for him the promises God had given to Abraham. But the Bible tells us that Esau showed contempt for his rights as the firstborn (Genesis 25:34 NLT). God's divine favor did not rest on Esau, but on Jacob. Why did Esau wear a wolf head and wolf skin when he was hunting? He wore it as camouflage for hunting. It was common practice in that part of the world at that time. Why was Esau so foolish as to sell his birthright for a bowl of stew? Esau lacked self-discipline and foresight in this regard. Although he claimed to be dying of starvation, he was surely exaggerating. He focused on his immediate need and did not consider the long-term consequences of giving up his birthright. Perhaps he thought that the birthright was not so important because he was favored by his father. What kind of stew did Jacob offer to Esau? All we know is that it was a lentil stew. The Bible tells us, Then Jacob gave Esau some bread and lentil stew. Esau ate the meal, then got up and left. He showed contempt for his rights as the firstborn (Genesis 25:34 NLT). What is the blessing that is spoken over a son? A blessing is a pronouncement of good over someone. In this case, it is the declaration of a father of the good that will come upon a son. Since the father is the priest of the family, his spoken blessing carried special weight and had real effects on the future wellbeing of the recipient. How do you know that the man Jacob wrestled with was Jesus? After they finished wrestling and the "man" left, Jacob named that place Peniel (which means "face of God"), and he said, I have seen God face to face, yet my life has been spared (Genesis 32:30 NLT). So we know that Jacob was actually wrestling with God. Whenever God manifests Himself, it is called a theophany. And whenever God appeared on earth in the form of a man, theologians believe it was an appearance of Jesus. When God spoke to Moses from the burning bush, why did He tell Moses to take off his sandals and that it was holy ground? The ground where Moses stood became holy because of God's revealed presence. In eastern countries, it is customary to take off shoes and sandals when entering someplace special like a home. On a deeper level, Moses' sandals were dirty, and taking them off was an acknowledgement by Moses that he was sinful and was in the presence of the holy God. How could Pharaoh's court magicians turn their staffs into snakes? Pharaoh's magicians used the powers of Satan to copy the miracle that occurred with Moses' staff. Moses did not have miraculous power; it was God who changed Moses' staff into a serpent and back into a staff. Why didn't Pharaoh ride his chariot down between the parted waters of the Red Sea? There were boulders in his way and his army was rushing past him, so he was blocked from going further. Did Pharaoh die when the waters came back together? The Bible does not specifically say that Pharaoh died, so we do not know with certainty that he did drown. On the other hand, all of Pharaoh's army that chased the Israelites into the sea perished. The Bible records, Then the waters returned and covered all the chariots and charioteers–the entire army of Pharaoh. Of all the Egyptians who had chased the Israelites into the sea, not a single one survived (Exodus 14:28 NLT). Why is there so much talk about following "rules" when the episode is about God's holy commandments? Moses does not use the term "rules." It is mostly the children who use the word "rules," which is a term they relate to better than "commandments." Moses referred to the Ten Commandments as commandments, and he referred to other parts of the Law as statutes and judgments. Moses only used the word "rules" in regard to the command for the people to not approach the mountain. Why did Moses tell them to only collect enough manna for one day? God commanded this to teach the people to trust in His daily provision. They could rest in the knowledge that God was watching over them every day and would provide what was needed for each day. Why does God appear to Moses at one time as a fire, and another time as a light swirling around him? We know that God has manifested Himself to people in various ways. He spoke to Moses from the burning bush (Exodus 3:2) and a cloud (Exodus 34:5), the Holy Spirit descended upon Jesus as a dove (John 1:32), and on the day of Pentecost the Holy Spirit came with the sound of a rushing wind and tongues of fire (Acts 2:1-4). Toward the end of the episode, when Moses was praying by himself on the mountain, what was it that came down by him? It was the Lord coming down in the form of a cloud. The Bible tells us, Then the LORD came down in a cloud and stood there with him; and he called out his own name, Yahweh (Exodus 34:5 NLT). How could David kill a lion? The power of God came on David and gave him the courage and strength to kill a lion. Another time, David killed a bear (1 Samuel 17:34-37). Why did God choose a young boy like David to be the future king of Israel? God looked at David's heart and saw that he had a desire to obey and please Him (1 Samuel 13:14; 16:7). Why did Samuel pour oil on David's head? The pouring of oil on David's head by the prophet Samuel showed that God had set him apart for special service. In other words, God had selected him as the future king of Israel. In addition, the oil symbolized the Holy Spirit. The Bible records that when Samuel poured the oil on David's head that the Holy Spirit came powerfully on David from that day on (1 Samuel 16:13). What kind of musical instrument did David play? David played a small harp or lyre. Who was the man taunting the Israelites, and why do you show him speaking some of the things that Goliath said in the Bible? In order to avoid the possibility of scaring some children with Goliath's prolonged and menacing presence, we created a Philistine man named Phicol to provide comic relief. The Bible records that Goliath was over nine feet tall (1 Samuel 17:4). How big was Goliath's spear? Goliath's spear had a thick and heavy wooden shaft, and the metal head of the spear weighed 15 pounds (1 Samuel 17:7). Why does the episode only show David picking up one stone instead of five? While the Bible does record that David picked up five stones, we focused on the central point of the story in that, through faith in God and with God's power, David defeated Goliath with a sling and a stone. Due to time limitations, we are not always able to show all of the details of a biblical story. All of the Superbook episodes are limited to about 28 minutes in length so they can be broadcast in 30-minute time slots. (This will enable us to take Superbook to many more children in the United States and around the world.) When you take into account the opening and closing songs as well as the end credits, we only have about 22 minutes to tell the whole story. Part of that time is allotted to Chris and Joy in their modern-day setting so kids can learn an important and relevant life lesson. As you can see, we simply do not have enough time to cover every aspect of the biblical stories. It is our hope and desire that the adventures of Chris and Joy will inspire children to find out more about the stories. One of the goals of the Superbook series is to get children excited about reading the Bible. What was the golden glow that was on David when he was about to fight Goliath? The glow shows the Spirit of the Lord that came on David to enable him to defeat Goliath (1 Samuel 16:13 NLT). Did David kill Goliath with the sling or the sword? The Bible records that David defeated Goliath with a stone and a sling. After Goliath fell to the ground, David took Goliath's sword and killed him (1 Samuel 17:49-51). Where was the ancient city of Babylon? The city of Babylon was in the area that is now called the nation of Iraq. In the Old Testament, "Babylon" refers to both the city of Babylon and the region of Babylonia. Did Daniel and King Darius live around the same time as Shadrach, Meshach, Abednego, and King Nebuchadnezzar? Daniel, Shadrach, Meshach, Abednego were all taken as captives to Babylon when King Nebuchadnezzar conquered Jerusalem. Because of his great God-given wisdom, Daniel served in important governmental positions under a series of kings: Nebuchadnezzar, Belshazzar, and Darius. What was the seal put on the rock that covered the lions' den? To keep people from attempting to move the stone to rescue Daniel, some clay was pressed against the stone and the covering of the lions' den. The king then pressed image on his ring against the clay to leave an impression in it. This was the royal seal of the king and meant that no one was to tamper with it. How did Daniel know Joy's name after he had just said that he did not know Chris' and Joy's names? Daniel did not know their names when they first entered his home, but moments later he heard Chris say Joy's name. Why didn't you show the accusers being thrown in the lions' den? As soon as King Darius told Daniel's accusers that they would discover exactly how mighty the lion's roar can be, Superbook took Chris, Joy and Gizmo back home. Superbook took them back because they had learned the lesson of doing the right thing even when it is not easy. Did the star of Bethlehem appear at the time of Jesus' birth or two years before? Did the magi arrive when Jesus was a newborn baby or when He was a young child? Bible scholars are not in agreement as to the exact time when the star appeared and when the magi arrived. Some believe that the star appeared when Jesus was born, the magi then saw the star, began their journey, and arrived months or years later. Another view is that the star appeared before the birth of Christ, so the magi began their journey sooner and arrived when Jesus was born. "The First Christmas" shows the latter understanding of the events. This also allows children who have seen traditional nativity scenes to be able to relate well to the nativity scene in "The First Christmas." Was Jesus born in a wooden stable or cave? The Bible tells us that Jesus was placed in a manger, which is a feeding trough for animals. The Gospel of Luke records, She gave birth to her first child, a son. She wrapped him snugly in strips of cloth and laid him in a manger, because there was no lodging available for them (Luke 2:7 NLT). On the other hand, the Bible does not tell us if the manger was in a stable or cave. "The First Christmas" follows the traditional view of Jesus being born in a wooden stable. This allows for children who have seen traditional nativity scenes to be able to relate well to the nativity scene in "The First Christmas." Where was the host of angels that appeared to the shepherds and sang glory to God? If you look closely, you will see a multitude of angels singing in the clouds. Did angels really appear in and above the stable when Jesus was born? We know that angels appeared to the shepherds who were nearby. Although the Bible does not say that angels were there with Joseph, Mary, and Jesus, certainly God would have sent angels there to guard the newborn baby, even if they were not visible to the people there. A psalm speaks of God's angelic protection: If you make the LORD your refuge, if you make the Most High your shelter, no evil will conquer you; no plague will come near your home. For he will order his angels to protect you wherever you go. They will hold you up with their hands so you won't even hurt your foot on a stone (Psalm 91:9-12 NLT). In addition, we exercised creative liberty to produce a majestic visualization of the spiritual realm when the Savior was born. What age group is "Miracles of Jesus" intended for? Superbook episodes are generally produced for children from 5 to 12 years of age. However, because children differ in their spiritual development, sensitivity to dramatic depictions, and the type of programming they are accustomed to viewing, we suggest that parents consider which episodes are appropriate for each of their children. For some episodes, we advise parents to preview the episode before showing it to their children. The Bible doesn't specifically describe Satan, who is also called Lucifer or the devil; so we used creative license to show what he may look like. In the episode "In the Beginning," when Lucifer is first shown as an angel in heaven, he is depicted as an impressive angel with long blond hair. When he rebels against God, he is transformed into an evil creature, and his flowing hair becomes horns. Also, his body becomes reptile-like in appearance, assuming the look of the serpent in the Garden of Eden. (See Genesis 3:1.) We did not want to make Satan look like a character that could be misconstrued as a cool villain. We want children to understand that there is a real enemy and that he is evil. Why does a man in the crowd turn into Satan? In the script for this episode, the man is called "The Naysayer." He represents doubt, mockery, and lies. John 8:44 tells us that the devil is "the father of lies." Since the beginning, Satan has been an expert at deception and confusion. As an example, he transformed himself into a serpent in the Garden of Eden. Why does Satan appear in the storm? Was he causing it? Satan did not cause the storm, and his remarks reveal that he did not. In the episode we purposely had the storm begin to develop before Satan appeared. Also, the Bible does not say that Satan caused the storm. However, Matthew 8:26 tells us that Jesus "rebuked" the wind and the waves, and they became still. In other places in the Gospel, the word "rebuke" is used when Jesus takes authority over demonic power. (See Matthew 17:18, Mark 9:25, and Luke 9:42.) We used creative license to illustrate how the disciples did not display faith in God as they reacted to the chaos of the storm and their fear of drowning. Why is the demon-possessed man in the Gadarene tombs so scary looking, and why does his voice sound so strange? His voice sounds as if many people are speaking because he had so many evil spirits. Luke 8:31-32 refers to "the demons" (plural) speaking to Jesus. The Bible describes the demon-possessed man very graphically in both Mark 5:1-20 and Luke 8:26-39. At the end of "Miracles of Jesus," we see how Miraculo was able to "levitate" using a hidden wire, and we know that many magicians use smoke and mirrors to make objects like park benches "disappear." But how did Miraculo get Chris's cell phone to "fly" out of his pocket? In order to accomplish an illusion like this, Street magicians often use accomplices to secretly rig unsuspecting bystanders. Why was Jesus standing on top of the rock formation? He was speaking to a large crowd of people, and being on higher ground allowed his voice to be heard better. Why did Gizmo say that the word "Messiah" means "the Chosen One" instead of the "Anointed One"? The word "Messiah" is often translated simply as "Anointed One." Jesus certainly was anointed by God, for He said, The Spirit of the LORD is upon me, for he has anointed me to bring Good News to the poor. He has sent me to proclaim that captives will be released, that the blind will see, that the oppressed will be set free, and that the time of the LORD's favor has come (Luke 4:18-19 NLT). But Jesus' title as "Messiah" has a deeper and fuller meaning. He was anointed as prophet, priest, and king! Still, He did not come as the kind of king the people expected, for He said to Pilate, "My Kingdom is not an earthly kingdom. If it were, my followers would fight to keep me from being handed over to the Jewish leaders. But my Kingdom is not of this world" (John 18:36 NLT). Jesus is King of the kingdom of God! It is a Hebrew word that means, "Save us, we implore you!" It was an exclamation of praise by the people when Jesus entered Jerusalem. It reflects the words of Psalm 118:25, "Please, LORD, please save us. Please, LORD, please give us success" (NLT). What does "Baruch Haba B'Shem Adonai" mean? It is Hebrew, and it means, "Blessed is He who comes in the name of the Lord." This shout of the people hailed Jesus as the promised Messiah, and reflects Psalm 118:26, "Bless the one who comes in the name of the LORD. We bless you from the house of the LORD" (NLT). Why did Jesus ride on a donkey? Jesus was fulfilling one of the prophecies about the Messiah. This prophecy said, Tell the people of Jerusalem, 'Look, your King is coming to you. He is humble, riding on a donkey— riding on a donkey's colt' (Matthew 21:5 NLT). Why did they wave palm branches? When Jesus entered Jerusalem, the people waved palm branches to hail Him as the Messiah. The palm branches were waved as symbols of victory. In the ancient world, palm branches were used to welcome a king or victorious generals. Why did Nahshon keep warning the Roman soldier about Jesus? Nahshon was a character we created as a Pharisee. He represents the malevolent attitude and intentions of many of the religious leaders. For instance, the Bible records that the religious leaders planned to kill Jesus: It was now two days before Passover and the Festival of Unleavened Bread. The leading priests and the teachers of religious law were still looking for an opportunity to capture Jesus secretly and kill him (Mark 14:1 NLT). Why did Jesus look angry when He was clearing out the Temple? The outer courts of the Temple were supposed to be a holy place of prayer for people of all nations, but Jesus saw that some people had turned it into a place of dishonest business. At the end of the Passover meal, why did Jesus say, "This is the day that the Lord has made. Let us rejoice and be glad in it"? It was traditional for Psalm 118 to be sung during the Passover meal. One line from the psalm says, "This is the day the LORD has made. We will rejoice and be glad in it" (Psalm 118:24 NLT). The Gospel of Matthew tells us that Jesus and His disciples sang a hymn at the end of the meal, "Then they sang a hymn and went out to the Mount of Olives" (Matthew 26:30 NLT). Why is only one woman shown going to the tomb? The biblical events of "He Is Risen!" are taken from the Gospel of John. While the first three Gospels record that more than one woman went to the tomb, the Gospel of John only mentions Mary Magdalene going to the tomb. It says, Early on Sunday morning, while it was still dark, Mary Magdalene came to the tomb and found that the stone had been rolled away from the entrance (John 20:1 NLT). The Superbook writers and producers decided to follow the emphasis of the Gospel of John on Mary Magdalene. Why are the angels in the tomb not dressed in white? While the first batch of DVDs of "He is Risen!" depicted the two angels in the tomb as not being dressed in white, we have adjusted this aspect of the scene so subsequent batches of the DVD do show the angels wearing white (John 20:11-12). These changes have also been made for all domestic and international television broadcasts as well as for the upcoming curriculums called Superbook: Church Edition and Superbook: Family Edition. Why doesn't the angel in the tomb tell Mary to go and tell Jesus' disciples and Peter about the resurrection? In "He Is Risen!" the account of Jesus' resurrection follows what is recorded in the Gospel of John. That Gospel does not say that the angels told Mary to give a message to the disciples. Instead, the Gospel states that Jesus commissioned Mary to take the good news to the disciples. This is what the Gospel of John records: "Don't cling to me," Jesus said, "for I haven't yet ascended to the Father. But go find my brothers and tell them, 'I am ascending to my Father and your Father, to my God and your God'" (John 20:17 NLT). Why are the nail scars shown in Jesus' wrists instead of His hands? When the New Testament talks about Jesus being nailed in His "hands," it uses a Greek word that has a broader meaning than the English word "hands." The Greek word includes the hand, wrist, and forearm. Additionally, historians have discovered that when Roman soldiers crucified people, they drove the nails through the palms, wrists, or forearms. (If Jesus was nailed through His palms, then the soldiers would have also tied His arms to the cross with ropes.) So it is possible that Jesus was nailed through either His palms or wrists. Whichever way it happened, when can thank our Savior for dying for our sins. Why doesn't "He Is Risen!" show other events that occurred after the resurrection, such as Jesus appearing to the disciples in the locked room, or Jesus showing his scars to Thomas? We would love to be able to include more about the resurrection of Jesus in "He Is Risen!" However, all of the Superbook episodes are limited to about 28 minutes in length so they can be broadcast in 30-minute time slots. (This will enable us to take Superbook to many more children around the world.) Part of each episode has Chris and Joy in their modern-day setting so kids can learn an important and relevant life lesson. We also have to fit in the opening song, closing song, and end credits, so we simply do not have enough time to cover every aspect of the biblical stories. It is our hope and desire that the adventures of Chris and Joy will inspire children to find out more about the stories. 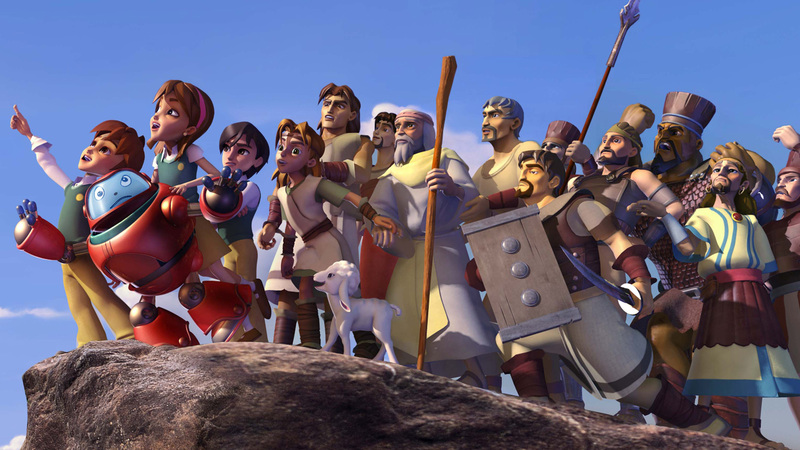 One of the goals of the Superbook series is to get children excited about reading the Bible. Why does the first part of the episode show Ananias in Jerusalem? Didn't he live in Damascus? Ananias said that the people with him should go to his home in Damascus, so he was only visiting the believers in Jerusalem. The Bible tells us, Now there was a believer in Damascus named Ananias (Acts 9:10 NLT). On the other hand, due to the intense persecution of Christians in Jerusalem, most of the believers who lived there fled the city. Why did you show Stephen being stoned? We showed part of the stoning so we could be as historically accurate as possible about Saul's previous actions and the persecution that occurred. However, we only showed the stoning as a black and white memory in order to diminish the scene's intensity and make it more suitable for children. On the road to Damascus, why did Saul's companions fall off their horses when the Bible says that the others stood speechless? We used creative license to emphasize the fact that the men with Saul were so amazed or fearful that they did not say anything. The Bible records how much they were struck by the events, The men with Saul stood speechless, for they heard the sound of someone's voice but saw no one! (Acts 9:7 NLT). Why did Jesus say that Saul was persecuting Him? Since Jesus was in heaven, how could He be persecuted? When Jesus was still on earth, He taught that whatever is done to someone who believes in Him is also done to Him. In one of Jesus' parables, the King says, I tell you the truth, when you did it to one of the least of these my brothers and sisters, you were doing it to me! (Matthew 25:40 NLT). When Saul was persecuting Christians, it was as if He was doing it to Jesus because the Lord lives in their hearts and they are so precious to Him. When Jesus spoke from heaven, why did Joy say, "It sounds like thunder!"? The Bible tells us that the men with Saul heard the sound of someone's voice (Acts 9:7 NLT). It might have been similar to when Jesus was on the cross and the Father spoke from heaven, I have already brought glory to my name, and I will do so again (John 12:28 NLT). The crowd heard the voice, but some confused it with thunder or the voice of an angel. The Bible tells us, When the crowd heard the voice, some thought it was thunder, while others declared an angel had spoken to him (John 12:29 NLT). Why did Ananias put a covering on his head when he prayed? In Israel, it was traditional for Jewish men to put a prayer shawl (tallit) on their heads when they said their morning prayers. When Ananias prayed, "Barukh ata Adonia Eloheinu melekh ha-olam," what did it mean? It was the first part of a traditional Jewish opening prayer. It means, "Blessed are You, LORD, our God, King of the universe…"
Why didn't you show a whale swallowing Jonah instead of a strange-looking huge fish? When referring to the creature that swallowed Jonah, the original Hebrew language in Jonah 1:17 and the Greek language in Matthew 12:40 means "a great fish." So these verses do not necessarily refer to a whale. In addition, we reviewed a number of English Bible versions, and they all used terms like "a great fish" or "a huge fish" in Jonah 1:17 instead of "a whale." In Matthew 12:40, in which Jesus talked about Jonah, modern Bible versions do not refer to a whale, but to a great fish or sea monster. The great fish could have been an enormous fish that is now extinct. The design of the great fish in Jonah is based on the appearance of the coelacanth. How could Chris and Joy breathe in the great fish? Why weren't they digested in the fish's stomach? God could have performed miracles to keep them supplied with oxygen and to keep them from being digested. Why did they cast lots to see who was the guilty one who caused the storm? In the time of Jonah, it was common for people in Israel and nearby countries to cast lots to determine a decision. In this case, the sailors cast lots to see who was the guilty person who brought God's judgment on them through the storm. The Bible records, Then the crew cast lots to see which of them had offended the gods and caused the terrible storm. When they did this, the lots identified Jonah as the culprit (Jonah 1:7 NLT). Is the prayer that Jonah prayed in the Bible? Yes. The Bible records that Jonah prayed to God from the belly of the great fish. You can read the whole prayer in Jonah 2:2-9. Why would God wait 40 days to destroy Ninevah? God wanted to give the people time to repent and change their ways so destruction would not fall on them. This shows God's unconditional love and mercy. Jonah prayed to God and spoke about the Lord's strong desire to not have to judge them. Jonah said, I knew that you are a merciful and compassionate God, slow to get angry and filled with unfailing love. You are eager to turn back from destroying people (Jonah 4:2 NLT). In addition, a period of 40 days is associated in the Bible with the humbling of oneself. Jesus fasted in the wilderness for 40 days, and Moses fasted on Mt. Sinai for 40 days (Matt. 4:2; Ex. 34:28). Why did the people of Nineveh put ashes on their heads, wear sackcloth, and fast? The people of Nineveh believed God's message, and from the greatest to the least, they declared a fast and put on burlap to show their sorrow. When the king of Nineveh heard what Jonah was saying, he stepped down from his throne and took off his royal robes. He dressed himself in burlap and sat on a heap of ashes. Then the king and his nobles sent this decree throughout the city: 'No one, not even the animals from your herds and flocks, may eat or drink anything at all. People and animals alike must wear garments of mourning, and everyone must pray earnestly to God. They must turn from their evil ways and stop all their violence. Who can tell? Perhaps even yet God will change his mind and hold back his fierce anger from destroying us' (Jonah 3:5-9 NLT). Why do you show the plant falling over instead of withering? The Bible says that that God sent a worm to attack the plant (Jonah 4:7). When the bush fell over in the episode, it revealed worm holes and tracks that had weakened its stem so that it fell over. Why were all of Jacob's sheep black? In the time of Jacob, there was a species of black sheep that was indigenous to the area he lived in. In addition, Jacob had made an arrangement with Laban to be paid with sheep that were speckled, spotted, or dark colored. According to the New Living Translation, some of the sheep he negotiated for were black. Jacob said to Laban, Let me inspect your flocks today and remove all the sheep and goats that are speckled or spotted, along with all the black sheep. Give these to me as my wages (Genesis 30:32 NLT). What was so special about Joseph's coat of many colors? The colorful coat set Joseph apart as Jacob's favored son, and it might have indicated that Jacob was planning on giving him a larger portion of the inheritance. If Joseph's brothers thought that he was going to receive a portion of their inheritance, it could have been part of the reason why they sold him to traders. What was the gold light that went into Joseph when Pharaoh told him his dream? The gold light was the Holy Spirit who enabled Joseph to interpret the dream God had given Pharaoh. Why did so little time pass when the car was stopped while Chris, Joy, and Gizmo were spending so much time in Egypt? Superbook always returns Chris, Joy, and Gizmo to the same time that they left from, no matter how much time they spent on their Superbook adventure. Which false god did the golden statue represent? It was a statue of Nebuchadnezzar. How tall was the idol? We know from the book of Daniel that the statue was 90 feet tall! The Bible says, King Nebuchadnezzar made a gold statue ninety feet tall and nine feet wide and set it up on the plain of Dura in the province of Babylon (Daniel 3:1 NLT). It was announced that anyone who did not bow to the statue would be immediately thrown into the furnace, so why did Shadrach, Meshach, and Abednego not get thrown in until later? The crowd at the ceremony was so huge that the king did not see their refusal to bow. Some people approached the king later to accuse them. The Bible tells us, But some of the astrologers went to the king and informed on the Jews (Daniel 3:8 NLT). Why didn't King Nebuchadnezzar say that the fourth figure in the fire looked like "the Son of God"? The original Aramaic of Daniel 3:25 records that King Nebuchadnezzar said the fourth figure looked like "a son of the gods." Nebuchadnezzar believed that there were many gods, so for him to refer to the fourth figure in the fire as "like a son of the gods," it was the same as calling him a god or divine being. In "The Fiery Furnace," the statement by Nebuchadnezzar was taken from the New Living Translation, which reads, 'Look!' Nebuchadnezzar shouted. 'I see four men, unbound, walking around in the fire unharmed! And the fourth looks like a god!' (Daniel 3:25 NLT). A number of modern Bible versions have similar translations of this verse (NET, NRSV, GNB). Why did you show Joshua talking to Jesus? The person who told Joshua how to defeat Jericho stated that He is the commander of the Lord's army. As the commander of God's host of angels, He certainly was not a mere human. Neither was He only an angel like Michael the archangel, for He said that Joshua was standing on holy ground. This is the same declaration that God had made to Moses out of the burning bush. An angel does not make ground holy only the presence of God can do that. So this was an appearance of Jesus. Was there something special about the crimson cord Rahab hung out her window? It is reminiscent of the blood that was applied to the lintels of the Israelite's homes in Egypt to protect them from the final plague on Egypt. As the blood protected the Israelites from the plague, the cord protected Rahab and her family from harm. In addition, the crimson cord can be seen as prophetically looking forward to the promised Messiah. The cord was crimson or scarlet in color, like the color of blood, and Jesus shed His blood on the cross for our sins. What's more, as the cord was the sign that saved the lives of Rahab and her family, Jesus has saved us and given us new life by shedding His blood on the cross. Why were there seven priests, seven trumpets, seven days of marching around Jericho, and marching around the city seven times on the seventh day? Seven is the biblical number of perfection or completion. The Israelites' faith in God and obedience to Him were perfected by following all of His instructions for conquering the city. God's battle plan did not employ human implements of war such as ladders to scale the walls or a battering ram to break open the gate. The Israelites had to trust in God's instructions even if they did not make sense to them. For the first six days, there were no visible results of their obedience to God. Finally, on the seventh day, when they had followed all of God's instructions, He gave them a supernatural victory. Why did the priests blow the trumpets? The trumpets, called shofars, heralded God's special presence, for the priests blowing the trumpets walked in front of the Ark of the Covenant. What was the golden box that was carried on poles? It was the Ark of the Covenant, which symbolized God's glory and special presence with His people. It was a rectangular wooden box with a representation of two angels resting on its lid. The entire ark (box, lid, and angels) were overlaid with gold. Inside the ark were the two stone tablets of the Ten Commandments (Ex. 25:16), a golden urn of the heavenly-supplied manna from the time the Israelites were in the wilderness (Heb. 9:4), and Aaron's staff that had miraculously produced blossoms and ripe almonds (Num. 17:8). These three items testified to God's goodness toward Israel through divine revelation, provision, and guidance. What caused the walls of Jericho to fall? The walls did not fall due to the natural effects of any human actions such as marching, blowing trumpets, or shouting. The walls were very thick and strong, and it was a supernatural act of God that knocked them down. It is possible that this was accomplished by the angelic warriors referred to by the commander of the Lord's army. Why didn't all of the walls of Jericho come down? God only had to knock down enough of the walls for Joshua's army to enter the city. In addition, if the walls had fallen down all the way around the city, it may have endangered Rahab and her family whose house was on the outer wall. Why is the king called "King Xerxes" instead of "King Ahasuerus"? Historians believe that King Ahasuerus is the same person as King Xerxes I. Why did Haman hate the Jews? Haman was very prideful in his position as the prime minister for King Xerxes. The king had commanded that lower ranking officials bow down and pay special respect to Haman, but Mordecai refused to do so. Mordecai must have felt that it was wrong to bow down as if to worship a man. Haman became extremely angry at Mordecai, and assumed that Jewish people were lawbreakers and not loyal to the king. Why did Chris and Gizmo get treated as slaves? The overseer of the slaves thought that Chris, Joy, and Gizmo were part of a group that had just been brought in as slaves to King Xerxes. Why was Mordecai dressed in sackcloth and ashes? Esther said that it was the clothing of one who grieves. Mordecai had learned of the decree that all of the Jews in the kingdom of Xerxes were to be killed. What was the place called Susa that Queen Esther referred to? It was the capital city of King Xerxes' kingdom and the place where the king's palace and throne were. Why did Esther ask all the Jews of Susa to fast for her? Abstaining from food and drink was a way of showing humility before God and to seek His divine favor and intervention in a situation. In this case, Esther wanted God to come to their aid and rescue them from Haman's evil plot. It is a royal staff that is held by a supreme ruler as a symbol of his or her authority. When Esther approached King Xerxes and he extended the golden scepter, why didn't she tell him right away about the devious plot to kill the Jews instead of inviting him to a banquet? By preparing a feast for the king, she honored him and would gain even more favor with him. In addition, while he was enjoying the banquet, he would be in a better mood and more likely to grant whatever Esther requested. Why did Esther invite the king to a second banquet? It may be that Esther felt that the time was not right during the first banquet to present her petition. In addition, she may have thought that she needed to gain more of the king's favor before accusing Haman, who was the king's highest official. Why couldn't the king just repeal the decree to kill the Jews? It was Persian law that any decree by the king that was written and sealed could not be repealed. King Xerxes himself said to Esther and Mordecai, Now go ahead and send a message to the Jews in the king's name, telling them whatever you want, and seal it with the king's signet ring. But remember that whatever has already been written in the king's name and sealed with his signet ring can never be revoked (Esther 8:8 NLT). Why did John the Baptist criticize the marriage of Herod Antipas and Herodias? John the Baptist told Herod, It is against God's law for you to marry your brother's wife (Mark 6:18 NLT). There were a number of problems with this marriage. To begin with, Herod had first had an improper relationship with Herodias when she was his sister-in-law. Then Herod and Herodias divorced their first spouses so they could marry each other. In addition, marriage to a brother's wife was not permitted in the Old Covenant (Lev. 18:16; 20:21), so the marriage of Herod and Herodias was a violation of one of God's commandments. Why did Jesus get baptized if He did not need to repent? Jesus did not need to repent because He had never sinned. When Jesus came to John to be baptized, John objected and said, I need to be baptized by you, and do you come to me? (Matthew 3:14 ESV). But Jesus answered John, Let it be so now, for thus it is fitting for us to fulfill all righteousness (Matthew 3:15 ESV). Jesus was always in a right relationship with the Heavenly Father, but in being baptized, He was identifying with sinners who needed righteousness, that is, sinners who needed to be in a right relationship with God. Jesus would ultimately identify with sinners when He, the one without sin, died for their sins on the cross. What was the significance of the Holy Spirit coming down on Jesus like a dove? A dove is a symbol of purity and innocence. Jesus once instructed His disciples, Look, I am sending you out as sheep among wolves. So be as shrewd as snakes and harmless as doves (Matthew 10:16 NLT). In addition, the dove was a sign from God to John the Baptist that Jesus was the promised Messiah. John testified, "I saw the Holy Spirit descending like a dove from heaven and resting upon him. I didn't know he was the one, but when God sent me to baptize with water, he told me, 'The one on whom you see the Spirit descend and rest is the one who will baptize with the Holy Spirit.' I saw this happen to Jesus, so I testify that he is the Chosen One of God" (John 1:32-34 NLT). Did John the Baptist and his disciples really eat locusts and honey? History records that locusts were eaten by people in the Middle East. The Old Covenant Law allowed the Israelites to eat locusts, for it says, You may, however, eat winged insects that walk along the ground and have jointed legs so they can jump (Leviticus 11:21 NLT). As a food, locusts were an inexpensive source of protein. They could be prepared as food in different ways. One way was to pound them, mix them with flour and water, and bake them into cakes. They could also be boiled, roasted, or stewed in butter. What is a cistern, and why would they put John in there instead of a jail? A cistern is an underground chamber for storing water. Cisterns would collect the natural runoff of rainwater during the rainy season so people would have water stored for the dry season. At times, a cistern was used as a prison cell. Did Paul really take a nonbeliever into the Temple? No, some Jews who did not believe in Jesus falsely accused Paul based on a faulty assumption. They had seen Paul with a Gentile earlier in the day. Then, when they saw Paul in the temple with some men, they assumed that the Gentile was with him. The Bible tells us about their misunderstanding: For they had previously seen Trophimus the Ephesian with him in the city, and they supposed that Paul had brought him into the temple (Acts 21:29 ESV). Why did the Roman soldier think that Chris, Joy, and Gizmo were prisoners? Since they weren't soldiers or sailors, he assumed that they were prisoners. Why did they put Paul on a prison ship to Rome to stand trial before Caesar? As a Roman citizen, Paul had the right to stand trial before Caesar. When standing trial before Festus (the Roman procurator of Judea), Paul asserted his right and said, I appeal to Caesar! (Acts 25:11 NLT). What did Paul mean when he said, "When I am weak, then I am strong"? Paul was saying that when he was weak in the natural sense, God would give him supernatural strength to accomplish His will. Since it was God's power and not Paul's human strength, God would get all of the credit and honor for what Paul was able to do. Paul wrote to the church in Corinth about his personal weakness and how the Lord had reassured him, "Each time he said, "My grace is all you need. My power works best in weakness." So now I am glad to boast about my weaknesses, so that the power of Christ can work through me. That's why I take pleasure in my weaknesses, and in the insults, hardships, persecutions, and troubles that I suffer for Christ. For when I am weak, then I am strong (2 Corinthians 12:9-10 NLT). How could Jesus appear to Paul in prison? Jesus appeared to Paul in a vision—a supernatural revelation from God. The Bible records, That night the Lord appeared to Paul and said, "Be encouraged, Paul. Just as you have been a witness to me here in Jerusalem, you must preach the Good News in Rome as well" (Acts 23:11 NLT). How do you know that the angel appearing to Paul on the prison ship was Gabriel? The Bible does not say which angel it was, but we do know that Gabriel delivered messages on two separate occasions in the New Testament. Gabriel appeared to Zechariah (Luke 1:11-21) and Mary (Luke 1:26-38), so it is possible that he also appeared to Paul. Why did the bite from the poisonous snake not harm Paul? God protected Paul from any harmful effects. How did Paul's prayer make the sick man well? This is an example of God working supernaturally through Paul to perform a miracle of healing. After the man was healed, even more people receiving healing. The Bible tells us, Then all the other sick people on the island came and were healed (Acts 28:9 NLT). In this way, many of the islanders were touched by the power and love of God. Why was the man with the sword chasing Chris, Joy, and Gizmo? Like the other people in the town, he was an evil person who did bad things. It might be that he wanted to capture Chris, Joy, and Gizmo, and sell them as slaves so he could make money. Why does God tell Noah to make an ark of cypress wood instead of gopher wood? "Gopher wood" is a term used in some Bible translations, but a number of modern Bible translations use the word "cypress" instead. "Gopher" is simply a way of writing the original Hebrew word in English according to how it sounds in Hebrew, and is called transliteration. But Hebrew scholars do not know which tree "gopher" refers to. It may have been cypress, for cypress wood is very durable, and cypress trees grow in abundance in the region of southwestern and western Asia. In Noah's time, a cubit was the standard unit for measuring length. It was determined by the length of the forearm from the elbow to the tip of the longest finger. Many years after the time of Noah, the Hebrew people used a standardized cubit that was 17.5 inches (44.45 cm) long. It is a thick, dark substance that could be brushed on to something to make a covering. Once the tar was dry, it would keep out water. It was enormous about 450 feet long, 75 feet wide, and 45 feet high! It was about one and a half North American football fields long. In terms of meters, it was about 138 meters long, 23 meters wide, and 13.8 meters high. When measured in cubits, it was 300 cubits long, 50 cubits wide, and 30 cubits high. Why didn't any of the animals fight and kill other animals when they were boarding the ark? God could have made them peaceful and non-aggressive during the time that they entered the ark. Once on the ark, they would have been kept in separate compartments. Did God really shut the door of the ark? Yes, He did. After Noah, his family, and the animals entered the ark, it was God Himself who closed the door of the ark. The Bible records, Then the LORD closed the door behind them (Genesis 7:16 NLT). What was the water shooting up out of the ground? That was water bursting up from huge underwater aquifers. The water that shot up out of the ground would have fallen back to the earth as a mighty downpour of rain. The Bible tells us that all the underground waters erupted from the earth, and the rain fell in mighty torrents from the sky (Genesis 7:11 NLT). Bible scholars and scientists believe that before the flood, massive amounts of water were stored in the earth's crust. Water from these aquifers would rise up as mist or springs to support and nourish plant life. It is thought that it had probably never rained before the flood, for the Bible says that the LORD God had not yet sent rain to water the earth and that instead, springs came up from the ground and watered all the land (Genesis 2:5-6 NLT). Why didn't the huge waves cause the ark to turn over? God designed the ark to be extremely stable and seaworthy. Modern scientific experiments with scale models of the ark have demonstrated how remarkably steady it would have been in rough seas. What kind of branch did the dove bring back, and what was the significance of it? The dove brought back a fresh olive leaf (Genesis 8:11). This was a clear indication that fruit trees were now appearing and that the people and animals could soon leave the ark. What does the flood show us about God? God was grieved by how very evil mankind had become. The Bible records, The Lord observed the extent of human wickedness on the earth, and he saw that everything they thought or imagined was consistently and totally evil (Genesis 6:5 NLT). God's holiness and goodness are revealed in that He did not let mankind continue as it was with people hurting and killing each other and doing all kinds of sinful things. On the other hand, God's love and mercy are shown in that He did not destroy all of mankind. He spared Noah and his family because Noah was a good person who tried to please Him. The Bible tells us, "Noah was a righteous man, the only blameless person living on earth at the time, and he walked in close fellowship with God" (Genesis 6:9, NLT). What was the significance of the covenant God made with Noah after the flood? Haven't there been dangerous floods since the time of Noah? God said that there would never again be a flood that would kill all living things on the planet. While there have been destructive local and regional floods, there has never been a global flood since then. God promised Noah, Yes, I am confirming my covenant with you. Never again will floodwaters kill all living creatures; never again will a flood destroy the earth (Genesis 9:11, NLT). God is always faithful to keep His promises. I am a member of the Superbook DVD Club. Why haven't I received my copies of "Revelation: The Final Battle!" yet? "Revelation: The Final Battle!" is a special feature and is not a part of the Superbook DVD Club at this time. DVDs may be ordered individually at CBN.com or by calling 1-800-759-0700. DVD Club members will receive 1 DVD plus 2 free copies for each .00 gift. In “Peter’s Denial,” Jesus said to Peter, “Simon, Simon, Satan has asked to sift each of you like wheat” (Luke 22:31 nlt). What did Jesus mean by “sift”? Sifting was a common practice of farmers in ancient Israel. Sifting separated wheat from useless materials like dirt and rocks. They would sift the wheat by shaking it in a container with something like a screen so that the wheat would fall through and leave the unwanted materials behind. So Jesus was saying that Satan wanted to cause Peter so much trouble that he would be seen as useless or false. But Jesus prayed for Peter to come through the trial and to be a source of strength for other believers: “But I have pleaded in prayer for you, Simon, that your faith should not fail. So when you have repented and turned to me again, strengthen your brothers” (Luke 22:32 nlt). Why did Peter think that Jesus would be made king of Israel? Based upon their interpretation of Old Testament prophecy, the Jewish people mistakenly expected the Messiah to defeat the occupying Roman army, restore Israel’s sovereignty, and reign as king of Israel. But Jesus fulfilled the Messianic prophecies in a different way - He came as a suffering Servant to die for our sins. One day, He will return as a conquering King to rule over the whole earth. Peter was not afraid of the servant, but He was afraid of being arrested and possibly executed. After Jesus was arrested, Peter heard one of the Temple guards say about Jesus and his followers, “Oh, he will get his due, along with all of his followers.” Instead of holding to Jesus’ promise of eternal life, Peter thought of saving his earthly life. Why are the nail scars shown in Jesus’ wrists instead of His hands? When the New Testament talks about Jesus being nailed in His “hands,” it uses a Greek word that has a broader meaning than the English word “hands.” The Greek word includes the hand, wrist and forearm. Additionally, historians have discovered that when Roman soldiers crucified people, they drove the nails through the palms, wrists or forearms. (If Jesus was nailed through His palms, then the soldiers would have also tied His arms to the cross with ropes.) So it is possible that Jesus was nailed through either His palms or wrists. Whichever way it happened, we can thank our Savior for dying for our sins. Why was Jesus glowing after the Resurrection? We exercised creative liberty to help children understand that Jesus was in His resurrected body and not the same human body He had before the Resurrection. When Jesus rose from the dead, He still had a physical body, but it was a more glorious body. It could be that His divine nature and glory emanated from Him. This can remind us of when Jesus’ appearance changed on the Mount of Transfiguration. The Gospel of Matthew recounts what happened: “As the men watched, Jesus’ appearance was transformed so that his face shone like the sun, and his clothes became as white as light” (Matthew 17:2 nlt). People who have visited heaven have testified of the amazing glory of Jesus! Light and love radiate from Him - for He is the eternal Son of God! What is the land of Ophrah? Ophrah was a city north of Jerusalem. The precise location of Ophrah is not certain, but it was located in the area given to the Israelite tribe of Manasseh. They were people who roamed about from place to place. They invaded the land of Israel, and would steal their crops and animals. As a result, the Israelites had very little to eat and it was very difficult for them to even survive—they were faced with starvation. So they would try to hide themselves and their harvest in caves and strongholds. The Bible records, “The Midianites were so cruel that the Israelites made hiding places for themselves in the mountains, caves, and strongholds” (Judges 6:2 NLT). Why do you show Jesus speaking to Gideon? The Bible says that “the angel of the LORD” (Judges 6:12) spoke to Gideon, and theologians believe that the term “angel of the LORD” refers to an Old Testament appearance of Jesus. Additionally, in the account of Gideon, the Bible reveals that the angel of the LORD was the Lord Himself. The Old Testament often uses the terms “the angel of the LORD” and “the LORD” interchangeably, showing that they are the same. In other words, “the angel of the LORD” was “the LORD”, and we know that “the LORD” is the covenant name of God. Here is a key verse from the passage: “Then the LORD turned to him and said, ‘Go with the strength you have, and rescue Israel from the Midianites. I am sending you!’” (Judges 6:14 NLT). Why did Jesus call Gideon “mighty man of valor” when he was not courageous? Jesus was speaking to Gideon in terms of his potential when the power of God would work through him. We can see that God would help him, for Jesus declared, “I will be with you. And you will destroy the Midianites as if you were fighting against one man” (Judges 6:16 NLT). God can do great things through each one of us if we have faith and are obedient to Him. Why did Gideon ask for a sign? At first, Gideon did not realize that the visitor was the angel of the Lord. In addition, Gideon felt lowly and thought he was an unlikely person to lead a successful army. Gideon said, “But Lord, how can I rescue Israel? My clan is the weakest in the whole tribe of Manasseh, and I am the least in my entire family!” (Judges 6:15 NLT). Jesus gave him a sign by miraculously burning up the offering of food and then disappearing. The Bible says that the Lord spoke from heaven: “It is all right,” the Lord replied. “Do not be afraid. You will not die” (Judges 6:23 nlt). Why did Gideon keep asking the Lord for signs? Gideon continued to have doubts about God using him, but God was patient with him and fulfilled his request for additional signs. What is a fleece of wool? It is a single sheet of wool that comes from cutting a coat of wool off a sheep. Should we set a “fleece” before God today? No, God never instructed us to do something like that. The fleece was Gideon’s idea, and God accommodated Gideon’s doubts and requests. But if we look to our circumstances for guidance, we can be misled by chance events or the deception of the enemy. Instead of setting fleeces before God, we should look primarily to the Bible. We should also listen to what the Holy Spirit speaks to our hearts. Why did you make Satan look so scary? We wanted him to be seen as clearly evil and not to look like a cool villain. His expressions show his anger against God and His people. The “Job” episode clearly shows that God is more powerful than Satan. In addition, the Bible reveals that even a child who believes in Jesus can take authority over Satan when he speaks in Jesus’ name and binds a spiritual attack. Children can trust in the power of Jesus’ name! Please keep in mind that the general target age for Superbook episodes is children 5 to 12 years old. However, because children differ in their spiritual development, sensitivity to dramatic depictions, and the type of programming they are accustomed to viewing, we suggest that parents consider which episodes are appropriate for each of their children. For some episodes, we advise parents to preview the episode before showing it to their children. Why did the angels in heaven call Satan “the Accuser”? The Bible reveals in the book of Job that Satan is the “Accuser.” In addition, the Bible tells us that the Accuser dared to go before our holy and almighty God: One day the members of the heavenly court came to present themselves before the LORD, and the Accuser, Satan, came with them (Job 1:6 NLT). In addition, the book of Revelation calls Satan “the accuser.” It says, Then I heard a loud voice shouting across the heavens, ‘It has come at last—salvation and power and the Kingdom of our God, and the authority of his Christ. For the accuser of our brothers and sisters has been thrown down to earth— the one who accuses them before our God day and night’ (Revelation 12:10 NLT). Another term for Satan is “the devil,” which means “accuser” or “slanderer.” Jesus taught people about the nature of Satan when He said, He has always hated the truth, because there is no truth in him. When he lies, it is consistent with his character; for he is a liar and the father of lies (John 8:44 NLT). When Job cried out after learning of the loss of his children and possessions, was he angry at God? Job was not angry at God. He was expressing his intense heartache and sorrow. The Bible tells us, In all of this, Job did not sin by blaming God (Job 1:22 NLT). Why did Job tear his clothing? Job did that as a way of expressing his anguish at learning of the death of his sons and daughters. The Bible tells us, Job stood up and tore his robe in grief (Job 1:20 NLT). In the time and place where Job lived, tearing one’s clothes was a way to express grief. Why did Job shave his head and beard? It was a way for Job to show his mourning at the loss of his sons and daughters. It was a common cultural practice in his time for someone to shave his head and beard to mourn the loss of loved ones. Why did Satan pretend to be a weary traveler? Satan wanted to learn about Job’s reaction to the catastrophes he had suffered. He wanted to know if Job was blaming God. Although God knows all that occurs, Satan is limited in his knowledge and abilities, so he had to go where Job was to see what was happening. What did Satan mean by saying “skin for skin”? How was Satan able to give Job sores on his body? As a fallen angel, Satan had spiritual power that could be used for good or for evil. When God first created Satan as Lucifer, his powers were to always be used for good. But Satan chose to misuse his abilities by attacking Job. Each one of us has abilities that we should use only for good—to glorify God and to help people. Why did Job’s friends accuse him of sinning? They had the false belief that if someone suffered it was because he or she had sinned. Why was Job so angry with his friends? Job was suffering from the loss of his children and the extremely painful sores on his body. On top of that, his friends—who should have been a comfort to him—added to his suffering by falsely accusing him. When God posed a question to Job about the creation of the world, what part of the Earth were you showing? It did not look like any part of today’s world. Bible scholars believe that when the Earth was first created, there was only one great land mass. The Bible tells us the following about the third day of Creation: Then God said, “Let the waters beneath the sky flow together into one place, so dry ground may appear.” And that is what happened. God called the dry ground “land” and the waters “seas.” And God saw that it was good (Genesis 1:9-10 NLT). That land mass was later divided into continents by the catastrophic worldwide flood of Noah’s day. How could Job live another 140 years after he was already a grown man? People lived much longer during the ages that immediately followed the creation of the world. The Bible records that before the flood of Noah, people lived several hundreds of years. After the flood, people still lived for hundreds of years, but their life spans gradually began to shorten. Nevertheless, the Bible records that Abraham lived 175 years, and Isaac lived 180 years. It may be that Job lived shortly after the flood, so it is not unusual that he lived as long as he did. One of the reasons why the patriarchs lived longer may be that their DNA had fewer imperfections. When God created Adam and Eve, their DNA would have been perfect, but succeeding generations could have experienced increasing amounts of genetic mutations which could have left them more vulnerable to the aging process and disease. It could also be that after the global flood of Noah’s time, there were major changes in the world such as environmental and dietary challenges as well as increasing dangers of sickness and disease. How is it that a young boy like Micah was put in charge of the family’s sheep? Even though caring for a flock of sheep was a very important and challenging responsibility, it was not uncommon in ancient times for a boy to be a shepherd. An example of this is David in the Old Testament. He was the youngest of eight brothers, but he was put in charge of caring for their sheep and goats. The Bible tells us that when God sent the prophet Samuel to anoint the future king of Israel, he asked Jesse, “Are these all the sons you have?” And Jesse replied, “There is still the youngest. But he’s out in the fields watching the sheep and goats” (1 Samuel 16:11 NLT). Although being a shepherd was a demanding job, it was also a very humble and lonely position. It may be that the older brothers preferred more respected responsibilities. Why did you show the sinful behavior of the Prodigal Son? One of our goals when creating Superbook episodes is to be biblically, historically, and culturally accurate. In the case of “The Prodigal Son,” we wanted to realistically illustrate the downward turn of events in the Prodigal Son’s life as he followed the sinful ways of the world. We also wanted to show the disastrous consequences of his reckless behavior. On the other hand, we were careful to avoid depicting any indecent activity. In addition, when Jesus told the parable of the prodigal son, His listeners would have readily understood the implied elements of the story. However, since today’s listeners are living in a very different culture and historical period, they might not perceive some of the story’s implications. To overcome this difficulty, we provided a visual depiction of the Prodigal Son’s “wild living” in a “distant land” (Luke 15:13 NLT). Because children differ in their spiritual development, sensitivity to dramatic depictions, and the type of programming they are accustomed to viewing, we suggest that parents consider which episodes are appropriate for each of their children. For this DVD, we included an important note to parents in red font encouraging them to preview the episode before showing it to their children. The message is printed on the DVD case or cover and in the Family Discussion Guide. What were the pods that were fed to the pigs? The pods may have been the fruit of carob or locust trees. The pods were ground up and fed to animals. What is the Bible verse that is quoted at the end of the episode? The verse is found in Psalm 103:8. It says, “The LORD is compassionate and merciful, slow to get angry and filled with unfailing love” (NLT). I’d like to share some concerns/comments about specific episodes. How may I contact you? Please click on "Contact Us" at the bottom of this page to submit your feedback.